We’re all familiar I think with the term “quarter life crisis”. That period in your early twenties when you realise you’re not a teenager anymore and you have no idea what you want to do with your life – but you’re a proper adult now and people expect you to start making serious decisions. When really you were quite comfortable eating beans on toast, living with your best friends and going out on whatever weeknight you wanted to. I even wrote a blog on the subject way back when. 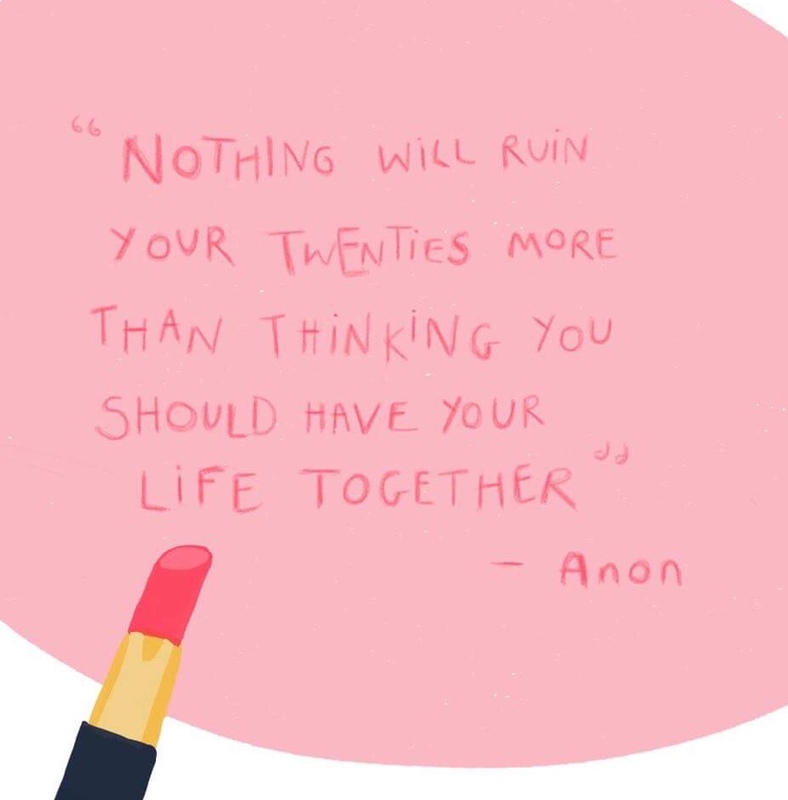 When you’re 27, going on 28, that’s when you’ve got your sh*t together right? You’ve had different jobs, experienced the working world, got used to boring adult stuff like paying council tax and shopping for cushions (okay, I actually really like shopping for cushions), know more about what you want out of a relationship, know more about yourself, maybe traveled to new places or perhaps got some new qualifications. You might even have bought your own place. This is when it all comes together right? WRONG. Over the last year, it’s dawned on me more and more that this isn’t the case. If I’m honest, although I’m very happy with a lot of things in my life (and by things, I really mean the people), I don’t feel like I’ve got it together at all. There are the practical grown up things I haven’t grasped yet (namely the art of a healthy sleep pattern – does anyone else always feel tired?! – eating healthily, exercising regularly and keeping a nice living space among others), but the main area of life where I’ve felt like I’m wading through treacle has been work. And by work I really mean in a broader sense than the job I’m employed to do – more, vocation I suppose. How do my skills fit into this world? How am I supposed to be using them? What am I even contributing? At first I thought it was just me…looking around it can feel like everybody around you is successful, or doing something better than you are. But the other day, a friend and I were talking over Whatsapp when she said something that made me think. “Bloody late 20s crisis that we are all in”, she exclaimed, “I thought I’d been through this already at 23”. The next day in a separate group chat, it came up again. “I’m starting to regret my life choices” said a doctor friend. I commented that it was a funny time of life, and that though we’d maybe moved up a bit from the bottom of the career heap, there were still big periods of change and self-reflection to be had (yup, typical person who likes to advise and re-assure everyone else whilst feeling stressed about the same things). “Still at the bottom of the heap” said another friend, who recently changed careers entirely. “Not arrived at the heap yet” said a third, who’s following her passions by sailing competitively full-time, and joked that maybe she just plays in boats because she’s scared of real life. Let’s face it, I phrased it badly, but what I meant wasn’t so much about position and rather that we’re all a few life lessons on from where we were…and yet still we all felt varying degrees of confusion. The truth is that among this trio of friends, all three of them were and are being seriously brave in their own ways. One is bravely soldiering on with the job she’s in (saving lives, no less), one is bravely learning a new career and the other is bravely pursuing her dreams. It was easier for me to tell them they’re brave than it is for me to say the same of myself. But the truth is that I‘m not alone in feeling like I don’t have it all together, and so what if I/we don’t? It doesn’t make us any less capable, or of any less worth. Could it be that you – yes you – are being brave too, however you’re muddling through? Previous Post When was the last time you took a real day off?